Oil sands mining fleets are subjected to some of the harshest conditions on earth. Equipment must be able to sustain brutally cold winters, abraisive silica sand, sticky bitumen and unstable ground conditions. Although the very first commercial oil sands mining operations used technology borrowed from the coal mining industry, operators have long since evolved to truck and shovel mining, which is much more efficient and cost effective. Learn more about mining equipment used in the oil sands. Originally, oil sands was mined and transported to the process plant using technology borrowed largely from the coal industry, specifically draglines, bucketwheels and mobile conveyors. Oil sands deposits were excavated by dragline and arranged in heaps along the sides of the mine. Bucketwheels scooped up piles of ore and dumped the oil sands onto conveyors that transported the material to the main processing plant. The draglines would dig out the face of the oil sands mine and place the piles of ore in a row along the side of the mine, where it would be later scooped up by the bucketwheel. The boom length on a typical oil sands dragline was 110 meters tall. These mega-machines were electrically operated and could excavate up to 6,000 tonnes of oil sands per hour, travelling up to 3 meters per minute. Bucketwheels would scoop up the oil sands ore (excavated by the draglines) and place the deposit onto mobile conveyors which transported the ore to the processing plant. A typical oil sands bucketwheel could span the length of a football field (120 meters) and stood 30 meters tall. The 12,000 hp machine was normally equipped with 14 buckets and could move 5,500 tonnes of material per hour. By the early 1990s, draglines and bucketwheels were replaced by cheaper and more efficient trucks and shovels. This transition was credited to have saved the oil sands mining industry, bringing operating costs down to a more reasonable price per barrel. Shovels excavate the ore from the mine face, dumping them onto the haul trucks, which transport the ore to the processing plant. Truck-and-shovel mining is now the norm in all oil sands mining operations. Truck-and-shovel operations use the "number of passes" to quantify mining metrics. This refers to the number of shovel loads required to fill a haul truck. The norm in oil sands is 4 passes - i.e., 4 shovel loads are required to fill a dump truck. This is normally completed in less than 2 minutes! Electric rope and pulley shovels are the workhorse of oil sands mining. Electric shovels are reliable and relatively low cost to operate. However, electric shovels are tethered to a power source. This restricts mobility and requires significant downtime when the shovel is relocated to a different part of the mining pit. Bucyrus and P&H electric shovels are the most commonly used in the oil sands. Hydraulic shovels offer better mobility around the pit and operate easily at different elevations. However, hydraulic shovels are less reliable since the oil used to control the shovel arm is susceptible to freezing in winter. Hydraulic shovels run on diesel and can burning up to 15,000 litres a day. Hydraulic shovels are sometimes reserved as back-up for the main electric shovels or used for removal of overburden. Haul trucks (or heavy haulers) used in the oil sands are some of the largest and toughest vehicles in the world. Working conditions in the mines can be harsh and this takes a toll on the mining fleet. Haulers deal with wet and soggy ground conditions in the spring, sometimes getting stuck in the soft soil. The brutally cold winter temperatures puts great stress on all mechanical components. Oil sands is quite sticky and clings to the undercarriage of the vehicle, which must get washed-off regularly. Despite its poor soil stability, oil sands is actually incredibly abrasive due to the high content of silica sand, which wears away at the metal frame of the haul truck. DID YOU KNOW? According to Syncrude, the optimimal mining temperature is -10°C. 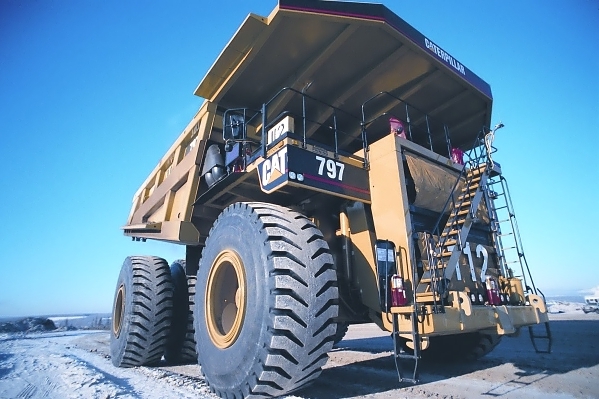 Haul trucks used in the oil sands are commonly supplied by Caterpillar and Lieberr. Suppliers work closely with oil sands operators to optimize the design of their vehicles, constantly improving fuel efficiency and reducing downtime. 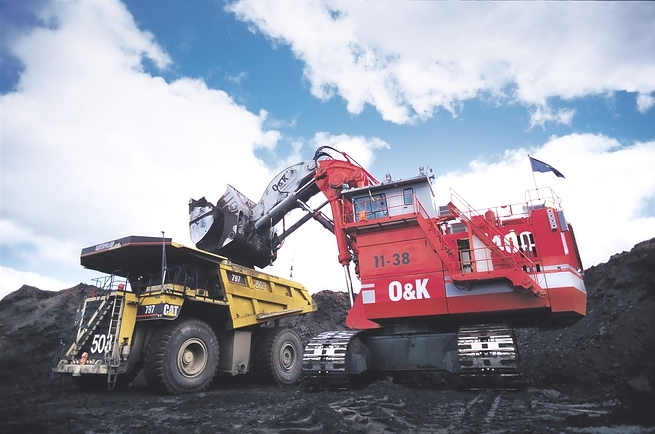 A payload of 400 tonnes is now considered the norm for oil sands mining operators. 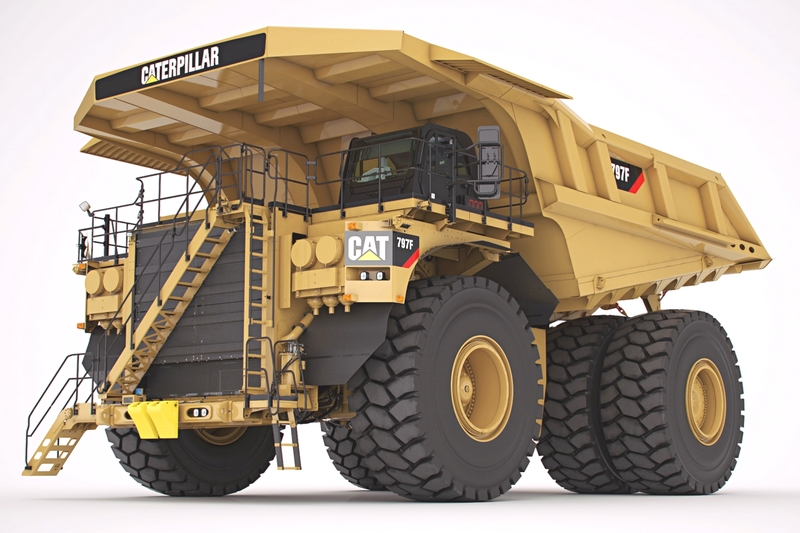 The 4000 hp Caterpillar 797F is one of the most popular models for newer mining fleets. A bigger truck means fewer trips to the processing plant, which greatly improves mining efficiency. Smaller haul trucks are normally reserved for removal of overburden and civil work around the mine site, such as road or dyke construction. Suncor Energy (then known as Great Canadian Oil Sands) began mining the Athabasca oil sands in the mid-1960s. Bucketwheels and mobile conveyors were initially employed at the mine site. The bucketwheels were phased out in the early 1990s as the company transitioned to truck-and-shovel, which is the technology of choice today. Suncor's bucketwheel remains on display at the Oil Sands Discovery Centre in Fort McMurray, Alberta. Syncrude began mining oil sands from Mildred Lake in 1978. 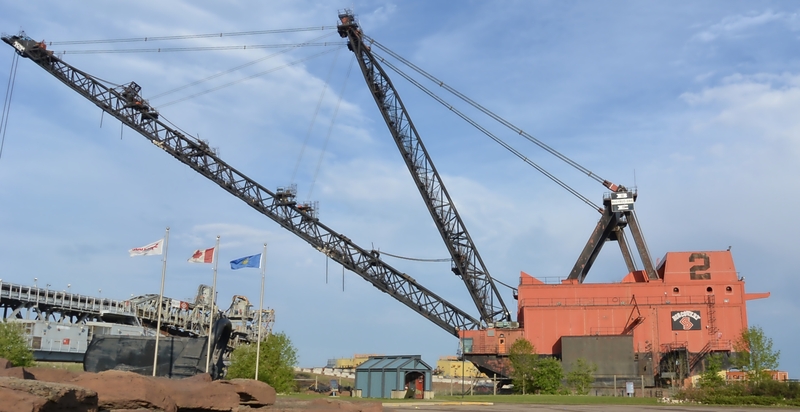 Syncrude's mining operation was very similar to Suncor's, initially using draglines and bucketwheels to shovel the ore onto conveyors that transported the oil sands to the processing plant. The company transitioned to truck-and-shovel mining in the late 1990s. Syncrude's retired bucketwheel and dragline are both on display along Highway 63 near Mildred Lake. 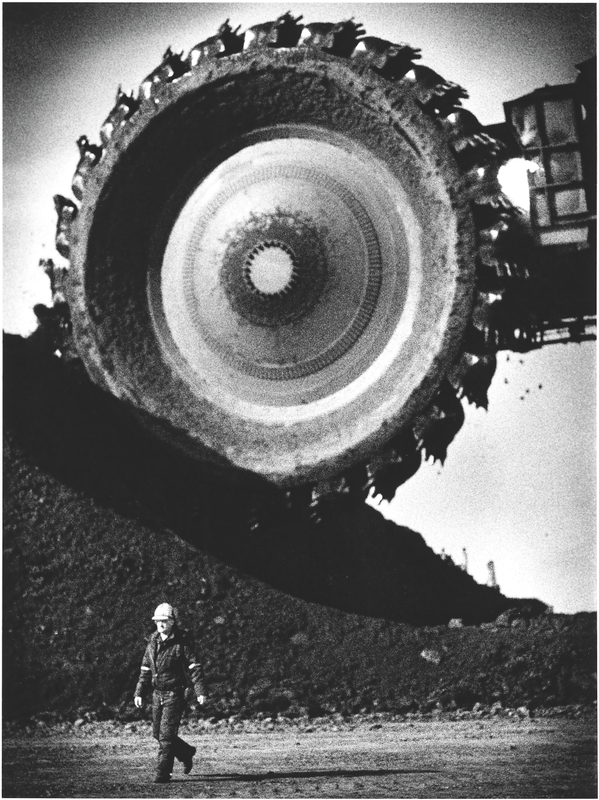 After the year 2000, all new oil sands mines employ truck-and-shovel mining techniques. This includes Shell's Muskeg River and Jackpine, CNRL's Horizon Mine, Imperial Oil's Kearl Lake and the upcoming Fort Hills Mine.